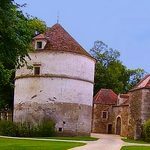 Carpe Diem, bed and board guest house is located a few kilometers from the dovecote Château d’ Epoisses. A dovecote was at the feudal time a building intended to lodge and raise pigeons. The dovecote, distant heir of the Roman columbarium, is more often named dovecote since the eighteenth century. The term dovecote can in a narrower acceptance design a dovecote shaped tower, usually independent of other buildings. Agricultural changes in modern times, through the introduction of fodder crops such as beet, have imperceptibly condemned the nurturing interest and the profitability of breeding in dovecote. The interior of the dovecote, space allocated to the pigeons, is divided into birdhouses called ‘boulins’. Each ‘boulin’ is the home of a couple of pigeons. These ‘boulins’ can be in stone, brick or mud. Installed during the construction of the dovecote or be in pottery (recumbent pots, channel tiles, various boxes), wicker woven basket-shaped or nest. It is the number of ‘boulins’ that indicates the capacity of the dovecote. In the middle ages, possession of a dovecote was a privilege of the lord. The right of having one, had to be related to the importance of the property. For a capacity proportional to the surface of the grounds. 1 ‘boulin’ for 1 acre, or ½ hectare. Producing an excellent fertilizer (columbine), the pigeons were seen as a disaster by the farmers especially at the time of sowing. It was therefore necessary to lock the pigeons in the dovecote during agricultural sowing, by obstructing the openings of the dovecote. Consult the availability of our bed and board guest house to organize your stay in the region.